Any dish that ends “…with ginger and chili” I am predisposed to like. It’s kind of my current favorite flavor profile. 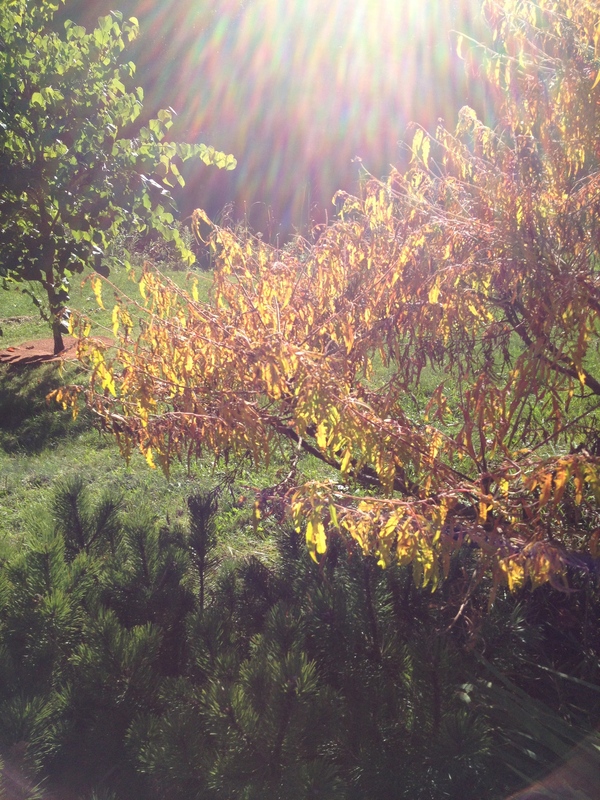 I generally like heat over sweet, and there is something medicinal, healing, about the combination. When I can remember to, I like to start my mornings steeping ginger and chili in hot water, sometimes with a little bit of fresh squeezed lemon, and if I’m feeling a stuffy nose coming on, a tiny bit of honey. 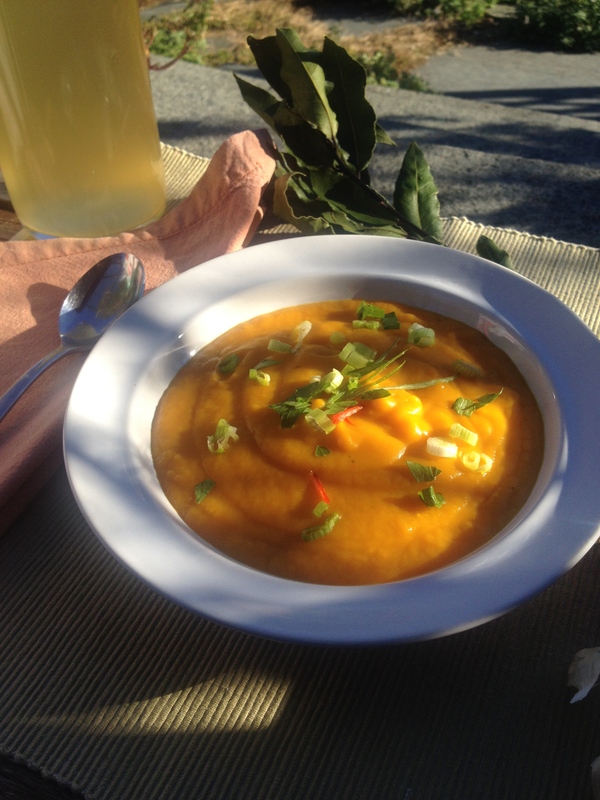 So when I stumbled upon a recipe for a spicy butternut squash soup I perused the ingredient list and liked what I saw: coconut milk, fresh ginger, fresh chili, cilantro, turmeric. 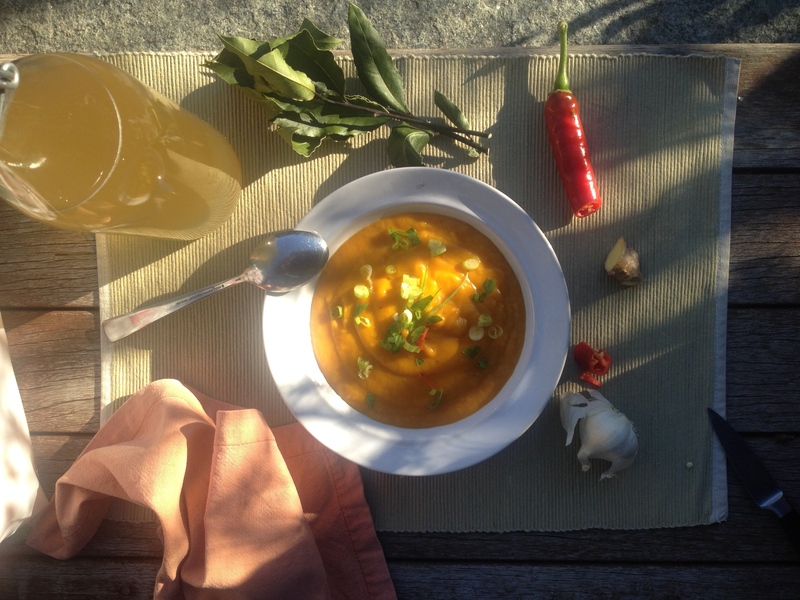 This was a recipe for October, for crisp weather and fending off colds. It is warmth in a bowl. In a large saucepan heat the oil on medium heat. Add the onion and sauté for about 5 minutes, or until it turns translucent. Add the ginger, garlic, and chili and sauté for about 1 minute, then add the cumin and turmeric. Stir, then add the carrot and celery and sauté for several minutes until they begin to soften. If the pan gets too dry you can add a spoonful or two of water, so the onions don’t stick. Add the squash, broth, and coconut milk, season with salt and pepper, and slowly bring to just before the boil. Turn the heat down and simmer until the squash is cooked through, about 20 minutes. Allow the soup to cool some before transferring to a blender or food processor. Blend until smooth, in batches if necessary. You can reheat the soup in its pan before serving if you’d like. Garnish the soup with sliced scallions and parsley or cilantro. 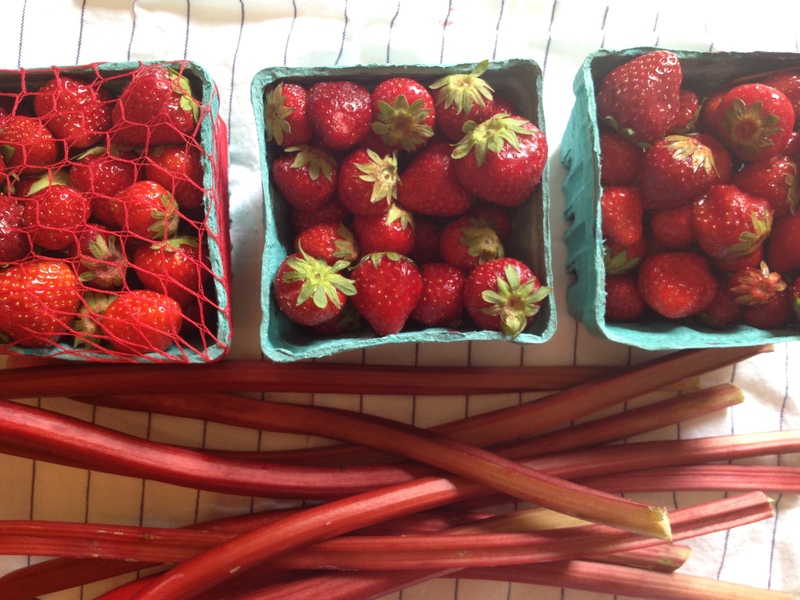 I’m the first to admit I’m a little late to the strawberry rhubarb party this year. It’s not my fault! My day job has turned into a day-and-night job leaving little time to tend to matters of the kitchen. Take heart, yesterday morning I woke up with my priorities straight. 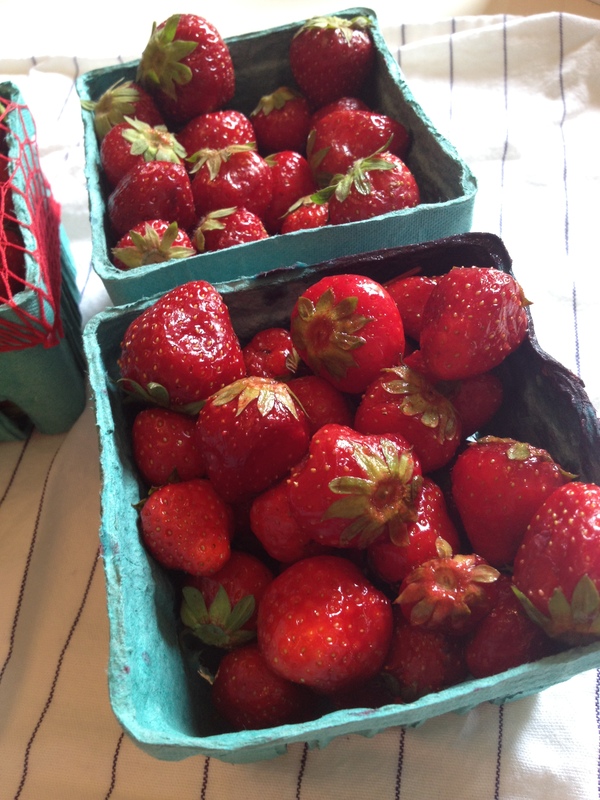 I ran (literally) to the Fort Greene farmer’s market (site of the fiddlehead fiasco a few weeks ago) to fetch strawberries so small and sweet they resembled raspberries and tasted like jam. And I was delighted to see the rhubarb still hanging around, weeks after I first saw it (and rushed by it) at the Union Square Greenmarket. But what’s that I see? Cherries?! I haven’t even tasted my first bite of a strawberry-rhubarb crisp this season and already there are cherries to contend with? Maybe next week. Yesterday I was on a mission and would not get distracted, no matter how sweet the cherries looked. I was after the classic strawberry rhubarb pie. 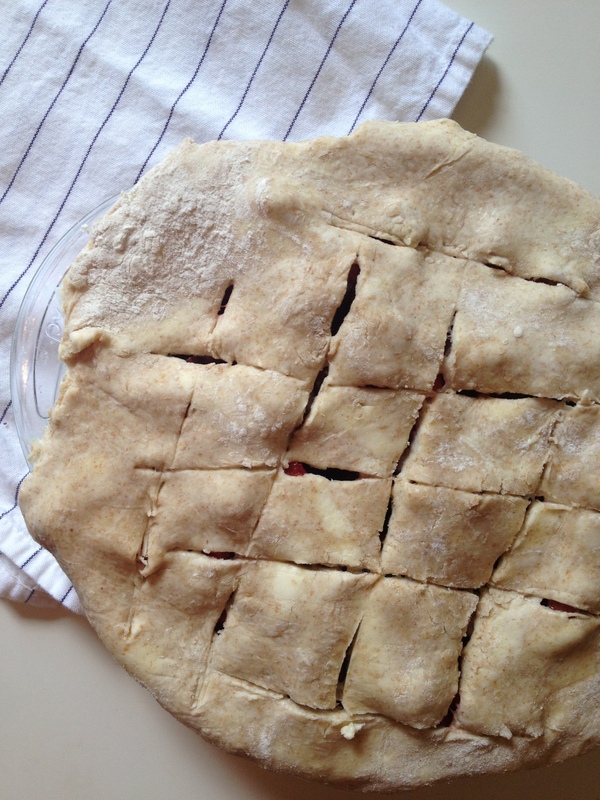 A fool’s mission, you may think, given the tendency for strawberries to explode mid-baking, making for a runny mess for your crust to sop up. So call me a fool. I love this particular pie. I love it in June (I love June period). I love it with ice cream or without. I love it standing up in a Brooklyn kitchen late at night or in a backyard in Vermont. And most importantly, so does my grandmother, and I wanted her to have a big ole piece of it. I thought about fussing of course. I picked up and smelled the herbs at the market, wondering at first how sage would go with these flavors, then thyme, then mint. And then wondered about balsamic vinegar and black pepper, before deciding to keep it simple. Well, mostly simple. The only two additions I allowed were freshly grated ginger and lemon zest, just to spice things up a bit without going completely rogue. I love the combination of rhubarb and ginger, and that of strawberry and lemon. The proof was in the filling: when baked this pie was not too sweet, but lusciously fruity, jammy, June-y, tart, with just a hint of the lemon and ginger to elevate the senses. 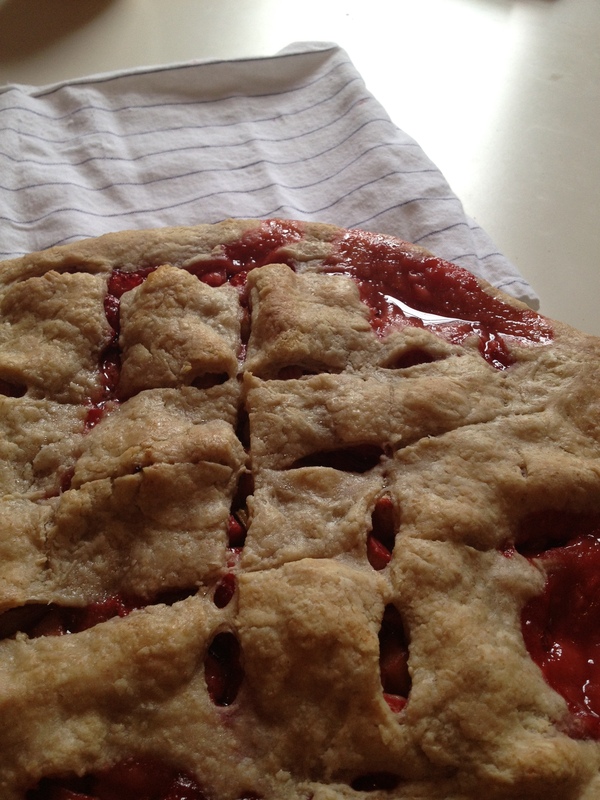 And fear not—the pie crust took all of five, maybe eight, minutes to make, and no food processor or pulsing required. I’d been wanting to try Cook’s Illustrated recipe using vodka in place of the water. The theory is that vodka, in large part pure alcohol, provides the necessary liquid to bind the dough, then cleverly evaporates during baking to yield a flakier crust. I proceeded cautiously and used only 1/4 c of ice-cold vodka (left over in my freezer from New Year’s), mixed with 1/2 c water. And you know what, the crust was buttery and flaky and darn tasty. 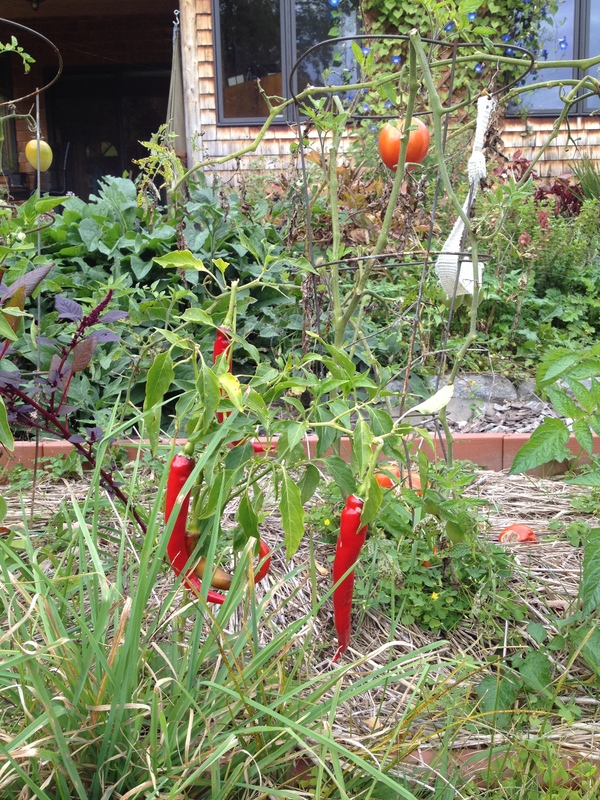 Next week: cherries anyone? And good luck to Rafa at the French Open this morning, I would love to see him put an end to Djoki’s streak. Only two months til the US Open! Combine the water and vodka, add an ice cube or two, and set aside. Mix the flour, sugar, and salt in a large bowl. 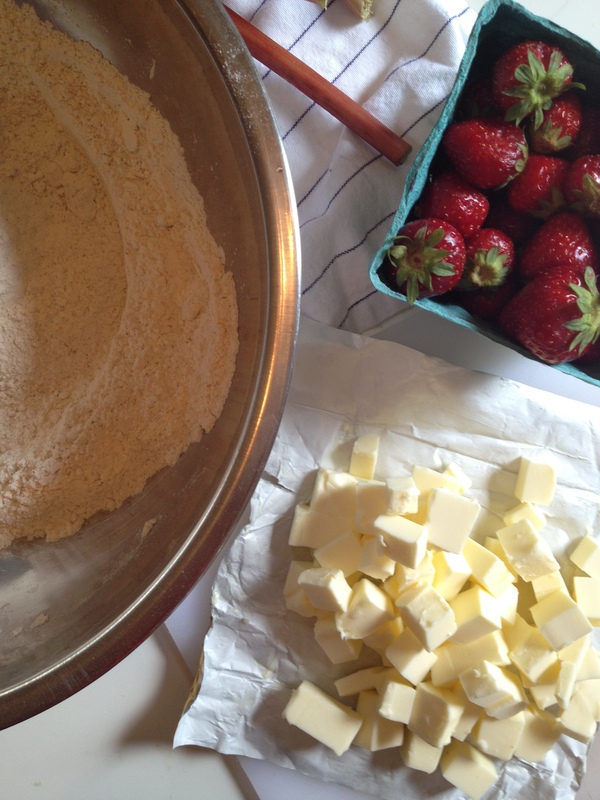 Add the butter and work quickly (with a pastry blender, whisk, or your hands) to combine until pea-sized crumbs form. Add 1/2 c of the liquid and continue mixing. You can add the rest if and when you need it, which you probably will. Separate the dough into equal halves, flattening a bit and transferring to plastic wrap. Refrigerate for a minimum of an hour and up to one week. Preheat the oven to 400 F. Prepare to roll out the dough by cleaning a large surface and flouring it. I like to roll out dough directly on a large piece of saran wrap. 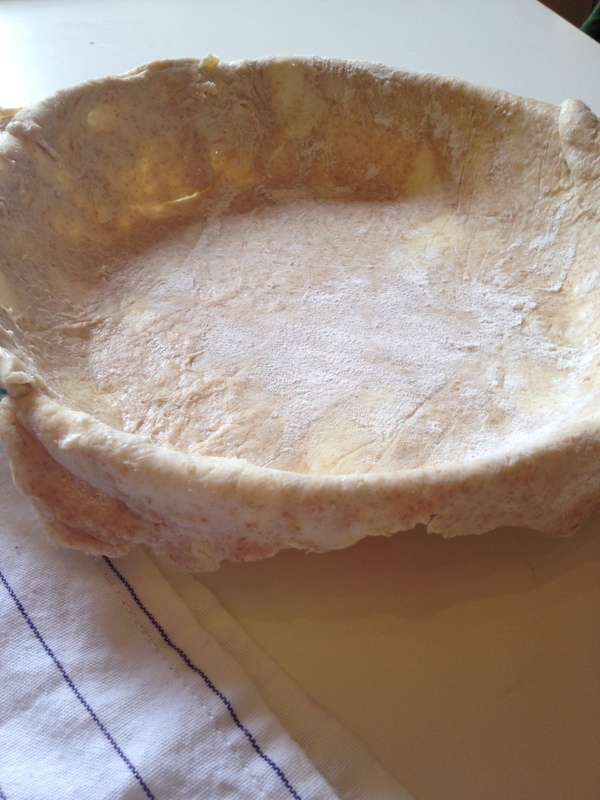 Roll half of the dough into a roughly 12- or 13-inch diameter. Carefully transfer to a 9-inch pie dish and set aside. 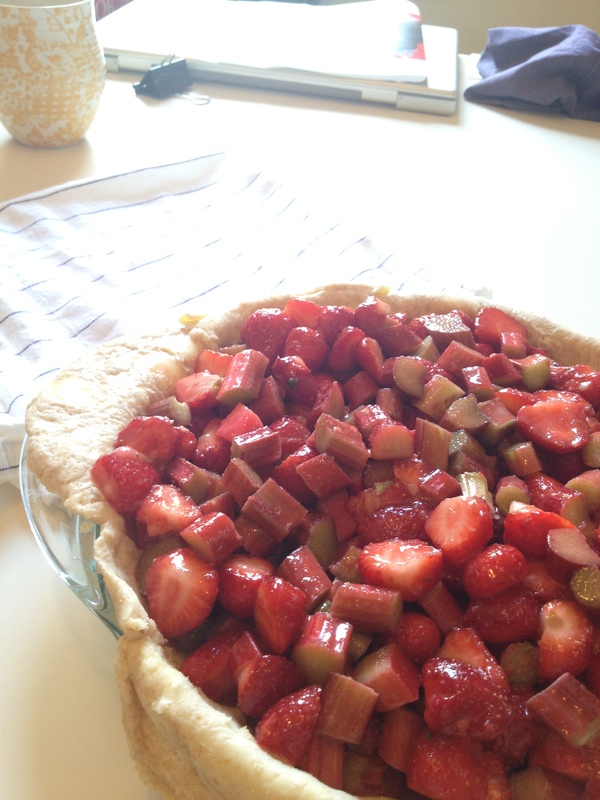 In a large bowl combine the rhubarb, strawberries, sugars, salt, zest, lemon juice, ginger, and corn starch. Transfer the filling into the pie crust. Roll out the second half of the pie dough, this time to a slightly smaller diameter. Transfer over top of the filling, pressing around the sides to remove any gaps. Trim the ends of the pie and crimp the edges. Make decorative slits to let steam escape. Brush the top with the egg yolk mixture. Place on a baking sheet and transfer to the oven, baking at 400 for 20 minutes, then turn the temperature down to 350 for an additional 20-25 minutes, until the crust is golden brown. Transfer to a wire rack to cool and let cool completely (if you can resist) before digging in. This is just a quickie teaser of a post since I should definitely be working not blogging right now. I have something like 100 captions to write today, artwork to send to the processor, essays to read, illustrate, and edit, oh and cover designs to choose for another book! Oy. I’ve written before about how every day (or close to that) I make a green smoothie: some form of greens like kale, chard, spinach, etc. blended with fresh fruit. It’s a good way to get lots of vitamins and chlorophyll into your system, chopped up finely so it’s easily absorbed. They also taste great. They also make captions more fun to write. Anyway yesterday morning I stumbled upon a great combination and wanted to share. 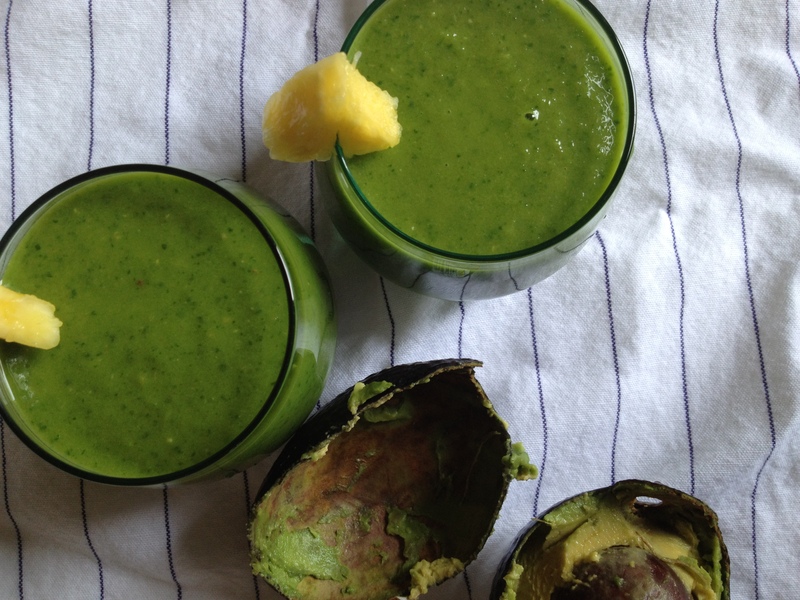 Spinach, fresh pineapple, avocado, and ginger. That’s it. Oh and water. This is in the top three green smoothies I’ve made in the past year (other favorites include dandelion greens-peach-banana, and romaine-grapefruit-mint-avocado). The fresh pineapple adds a real zing-a-ding-ding to the whole thing; the avocado makes it smooth and creamy. You start with 2-3 cups of fresh spinach and 12 ounces of water. Blend this. Then add 1 c fresh pineapple chunks, 1/2 avocado, and 1 tsp fresh ginger, and blend until smooth.